Wildlife conservationist, Alan Rabinowitz, stuttered as a child. However, he had a gift for talking to animals. Alan's parents took him to doctors and specialists looking for a cure for his stuttering, but it was the zoo that held the answer. At the Bronx Zoo, Alan fluently whispered a promise to a jaguar. 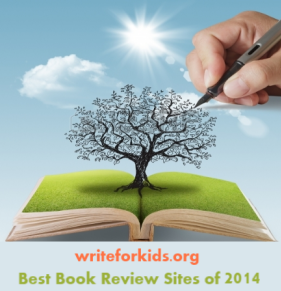 Young readers will empathize with Rabinowitz in this picture book autobiography. As an adult, Rabinowitz kept his promise and used his voice to speak for the animals, including the jaguar. Chien's acrylic illustrations capture the emotions of the characters. On one page, Alan stares out into the dark blue sky. The only words on the two-page spread read, "I can speak, but nothing has changed on the inside. I still feel broken." This is a contrast to the rich colors of the jungle on the following pages where Alan reflects, "The jungle makes me feel more alive than I have ever felt." 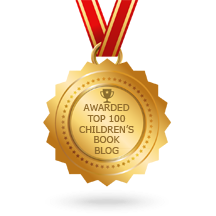 A Boy and a Jaguar is an inspirational true story of a young man who overcame adversity and had an impact on the world. Pair this book with The Watcher: Jane Goodall's Life with the Chimps or On a Beam of Light: A Story of Albert Einstein. 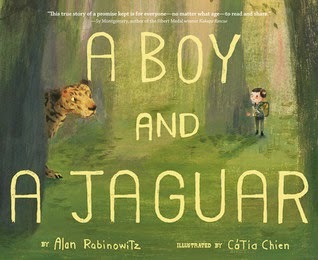 View the book trailer for A Boy and a Jaguar. Thank you for the kind mention of my review!